It’s taken a long time for Emily Dickinson to come out. During her lifetime (1830-86) only ten of her roughly 1,800 extant poems were published, some of them without her knowledge. After her death her manuscripts lay disregarded by all but a few. It was not till 1955 that anything close to a complete edition was published and Dickinson’s unique poetics began to receive the attention and honour they deserved. There’s a certain aptness about this long delay. She was a nineteenth century writer only in an accidental, temporal sense. As her readers know, in thought and style she’s essentially a twentieth or even twenty first century poet. Last month the outing of Emily Dickinson reached a new stage. Harvard University has published, free on the web in high resolution copies, the first phase of what it is careful to claim may not be a complete collection of Dickinson’s writings, the Emily Dickinson Archive (EDA). It’s a publication not free from controversy. Although Harvard’s Houghton Library has the largest collection of the manuscripts, others lie elsewhere. 800 manuscripts are housed in Amherst College in Amherst, Mass., Emily Dickinson’s home for almost all her life. The curators at Amherst College, though partners in EDA, are clearly unhappy with Harvard’s approach, based as it is on R.W. Franklin’s (allegedly incomplete) 1998 Harvard edition of the poems, and upset that they have not been treated as active partners in Harvard’s project. Only 539 of the 850 manuscripts at Amherst are included in EDA so far (all of them are available on Amherst’s Emily Dickinson site). It’s an unseemly row, one that echoes earlier hostilities between the rival collections at Harvard and Amherst, and, much further back, between the individuals who inherited Dickinson’s manuscripts. Though incomplete EDA is an impressive resource, and clearly to be welcomed. It’s easy to locate the poems. The digital copies are crisp and readable. You can zoom in to view small details of the images, compare the readings of the different published editions, and study the poet’s diction by searching the Emily Dickinson Lexicon. 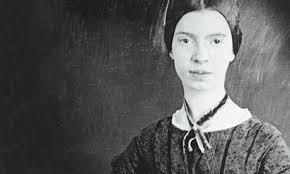 This poem proves how powerful the Emily Dickinson game can be, because it demonstrates the best of her strange craft: the argument that refuses to disclose its ‘meaning’, a conventional metre that yield unconventional rhymes (‘listener’), the word choice that stops the eye (pink’?! ), the sudden but ambiguous explosion of the field of reference at the conclusion. It’s almost too easy for the literalist to picture from this the pale and lonely recluse padding around her parent’s house in Amherst in her white dress (actually Emily seems to have worn plenty of coloured clothes). The trope develops comfortably enough before the sudden turn in the last two lines, which make the reader scurry back to reread the poem and try its meaning again. This time it isn’t bold metaphors that stop the eye, but the choice of small words – ‘I judge’, ‘at any time’ – that help us get beyond what might look a conventional reflection. Will not cry with joy “Pompeii”! At last, here is a poem for which EDA offers a digitised copy of the manuscript. It comes from one the ‘fascicles’ or bundles of poems Emily bound together in packets for safekeeping and doesn’t show the sorts of corrections or variants visible in other manuscripts (we can be sure that the repetition of ‘appalling’ in the same stanza is not accidental). The sloping hand is strong, flowing and confident. The famous dashes are really not much more than dots. These volcanoes remain at a distance, in travellers’ tales. They give rise to three successive hypotheticals (‘If … If … If’) and the poem ends back in the study with the ‘loving antiquary’, but it takes a complex journey. The EDA’s Lexicon glosses the word ‘phlegmatic’, ‘cool; calm; unperturbed; self-possessed; not easily aroused; [fig.] apparently dormant; temporarily inactive; [etymology play] deceptively calm; hiding intense heat and flames beneath an undisturbed exterior’. The intense heat and flames in Dickinson’s volcano are both supernaturally monstrous (‘taking Villages for breakfast’) and aggressively human, armed with explosives and weapons. The following two stanzas translate the twin theme of tranquillity concealing violence from the physical into the human world, but the final lines push beyond destruction and posit a third phase, one of the recovery of a life once lived. 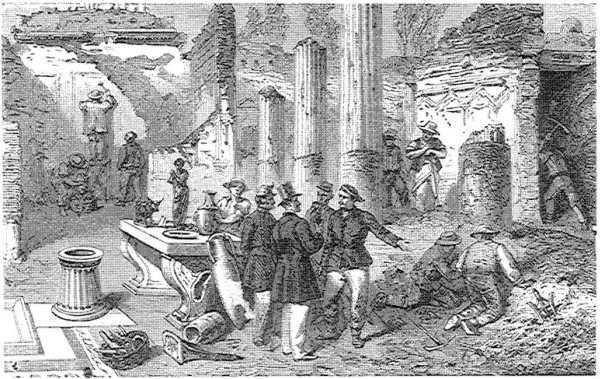 Dickinson’s religion was as unorthodox as her writing: she avoids ‘Resurrection Morn’ in favour of ‘Resumption Morn’, suggesting not a transfiguration in some imaginary heaven, but a restoration of a community, and by extension a self, on this earth: ‘… “Pompeii” / To the Hills return!’ By 1860, when Dickinson was writing, excavations begun by the French and continued when they left Naples in 1815 had revealed almost all of the western part of Pompeii, allowing the public to see its streets and buildings for the first time since the eruption of Vesuvius in 79 AD. The EDA’s facsimile shows Dickinson searching for the right verb for the penultimate word: she experiments with ‘slip’, ‘slide’ and ‘melt’ before preferring the much more carnal ‘ooze’ (the word is partly obscured in the manuscript by an inky smudge). In the first verse she tries the adjective ‘Volcanic’ before promoting ‘Volcano’ as the (more concrete) subject, with ‘life’ as predicate, and in the fourth line ‘erasing’ is finally promoted ahead of the more straightforward ‘endangering’. New Directions has just published a facsimile edition of some of the scraps, entitled The gorgeous nothings: Emily Dickinson’s envelope poems. The volcano theme is my favorite approach to E.D. I don’t know how you felt about the recent “A Quiet Psssion” but I had a bad reaction to the actress who portrayed her, hence left very early. “Insufficiently volcanic” would probably be my response to most attempts to portray this mysterious lady. I admit this is idiosyncratic, and had I stayed, I might have changed my mind; some critics have complimented Nixon on her performance. Curious as to your reaction.